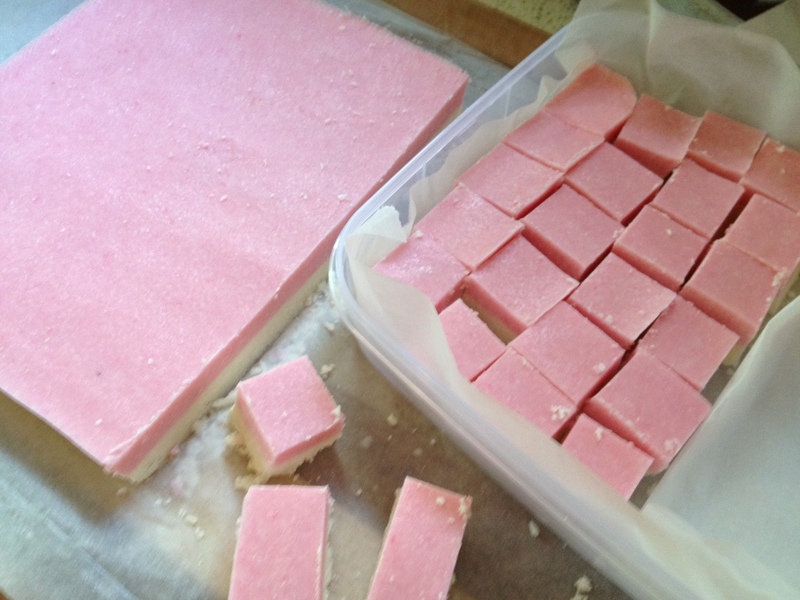 This is my prize-winning Coconut Ice recipe, which made me almost as much of a Show Queen as my precious cow 767. It has been entered in many agricultural shows, and won me incredible trophies. As well as the 22 Blue Ribbons and Prize Certificates, this recipe has netted me (among other things…) a tea-towel set, a glass cheese board, a clock set into the tummy of a plastic mouse, and the greatest one of all – a bottle of non-alcoholic sparking wine with a faux French Champagne label that made us all VERY excited. (None of us could read French and the label was tres` impressive!) It tasted so bad that it refreshed the droughty grass outside my kitchen window. That’s okay. I always got to eat all of the pieces that didn’t make it into the competitions, and that was the sweetest reward of all. This is a lovely recipe – easy for non-cooks, and with great keeping qualities. Which is a stupid thing to say really, because it never lasts long enough to prove those qualities. Make a batch of this and you’ll see what I mean. 500g icing sugar (4 cups of confectioners sugar for my USA friends), 250g unsweetened dessicated coconut (2 and 1/2 cups), 1/2 cup condensed milk, one egg white, 60g copha (1/3 cup of vegetable shortening), vanilla essence, pink food colouring. 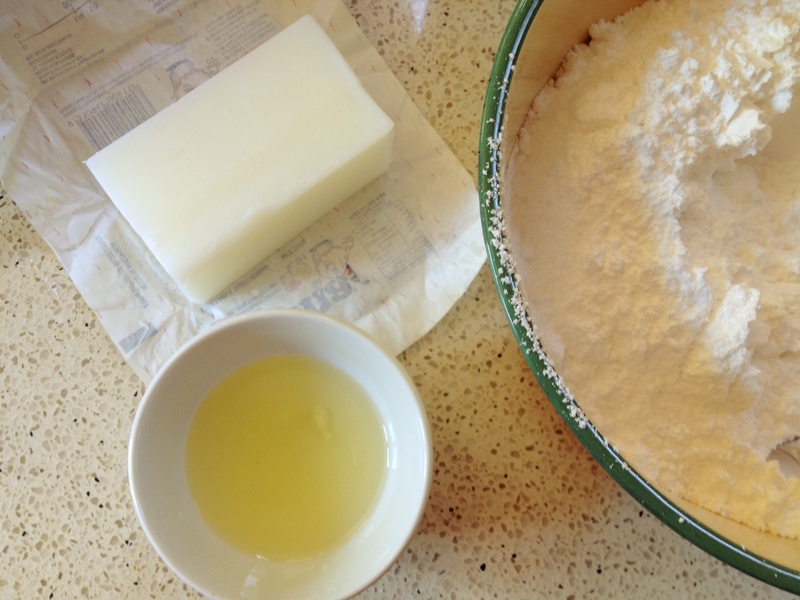 Sift the icing sugar into a large bowl, and then add the coconut and gently mix through to combine. Melt your copha and allow to cool slightly. 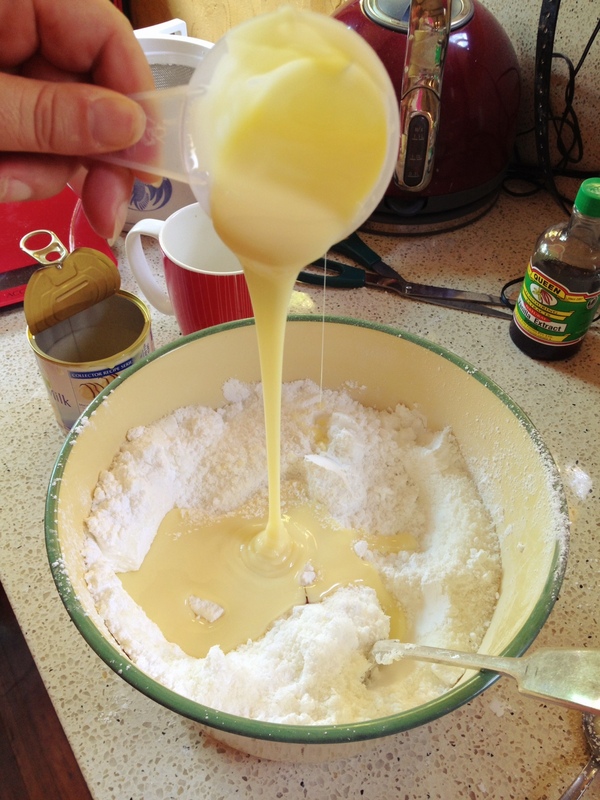 Whisk the egg white just a little, and add the egg and condensed milk to your dry ingredients. Then add your copha and a slug of vanilla essence ( a teaspoon or so should do it). Mix until well combined into a firm, moist mass. 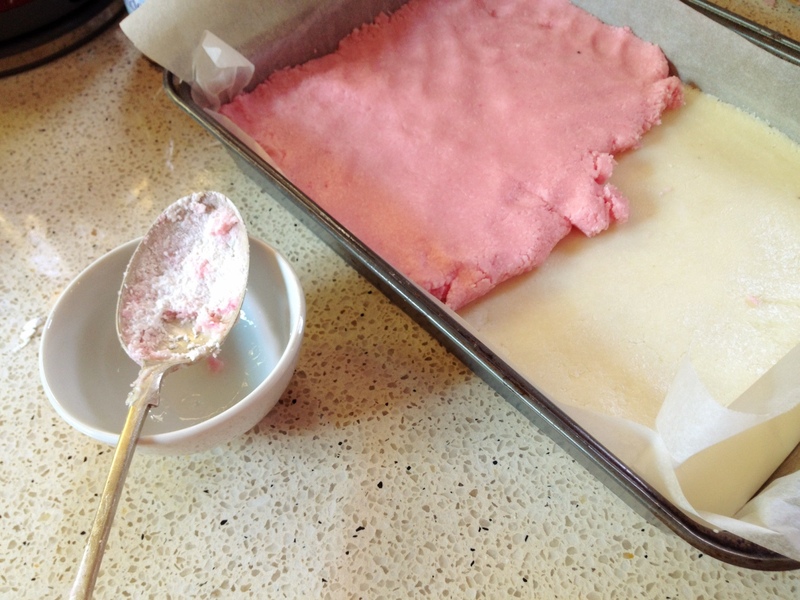 Divide the mixture in half, and colour one batch a cheerful pink with your food colouring. Perfect for gifts, or with a cup of tea as a happy-making treat. 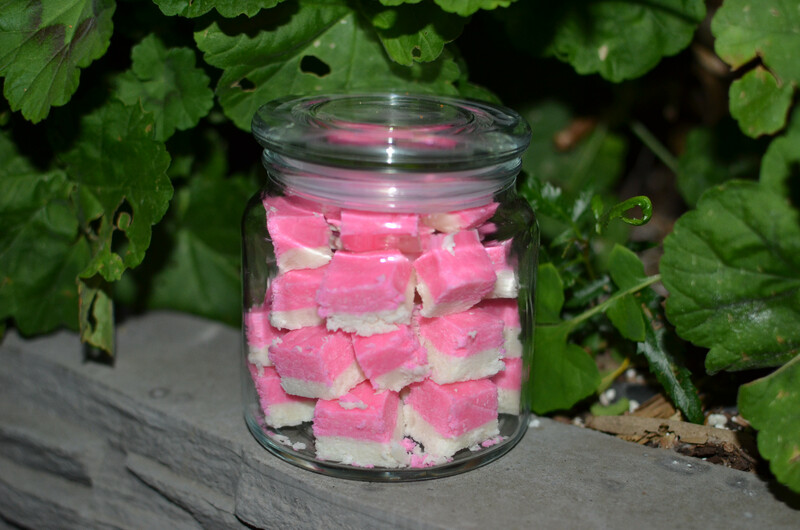 This entry was posted in Sweet treats and tagged agricultural shows, Australia, blue ribbon recipe, coconut ice recipe, coconut recipe, dessert, easy coconut ice, farmhouse cooking, food, gluten-free sweets, recipe by Cauldrons and Cupcakes. Bookmark the permalink. Thank you Nicole – with Christmas coming up and my normal ‘Christmas Sweet’ baskets already in the planning this is well timed and I look forward to making use of this recipe. I normally use green food colouring to make it more Christmasy. This brings back memories to me of school fetes. That is one special, out-of-sight recipe, Nicole! It’s lovely to look at, too! Exquisite! What an impressive array of awards, too. I will have to try this one, thank you for the recipe! Wow! How smooth is that pink layer??!! Ooooh, Nicole! These look yummy, yummy. I am a sucker for pink food! It looks very tasty , yet simple to make. But is there any other way of making it without adding egg. Cz I am vegetatrian , for the time being (Wil change back to non-veg ofcourse). So can you suggest anything else vegiterian instead of egg plz?? Thank you for adding the notes for those of us in the United States; or I would be totally lost!!! :D. This sounds yummy and looks easy to make with your directions!! Wow! Such perfect looking coconut ice and the first one I clicked on in my search. Can’t wait to try it. They don’t know about coconut ice here in Canada unfortunately but I have great memories from fetes in Zimbabwe. That looks awesome! Im gonna have to make some for valentines day! I will definitely try these. I am wondering if using coconut oil which is solid at room temp would add more of a coconut taste instead of vegetable shortening. Have you tried it that way? I actually like pics so that I have a rough guide as to what it might look like. This one’s so easy – it is hard to stuff up if you follow the directions! Even messed up it will be delicious! love this rendition of an old classic…you are the best! Came across your blog whilst looking for a coconut ice recipe & have lost the last 3 hours reading through your blog posts, quotes & recipes. I will definitely make a return visit. 🙂 ! can you freeze it to use at a later date? How long do you think this would keep? It looks like a great emergency work treat. Its very good of you to share rather than hoard your secrets! Wouldn’t pasteurized egg substitute be OK? I made this today and they turned out wonderfully. Thankyou looking for pink foods for this months Breast Cancer Pink Day. Nicole, these sound and look delicious! I shall have to give them a try. Thank you! I must warn you however, I am not good at following a recipe, I must make them my own with variations. Ok so I am sitting here wondering why I entered into the show under the catagory coconut ice as I do not even have a recipe for it. after much searching I landed here and with all the amazing awards this recipe has won it has to be the one! So off to get the ingredients and have a practice run before I have to make it next weekend. Great recipe. My daughter just won 2nd prize at the Royal Easter Show in Sydney for Coconut Ice with this. And she took the leftovers to her Girl Guides group who also enjoyed it. Thanks for sharing this. Congratulations to your daughter on her win, James! That’s very exciting news and I’m glad to see this recipe live on for the Show circuit. May she celebrate many more victories!!! 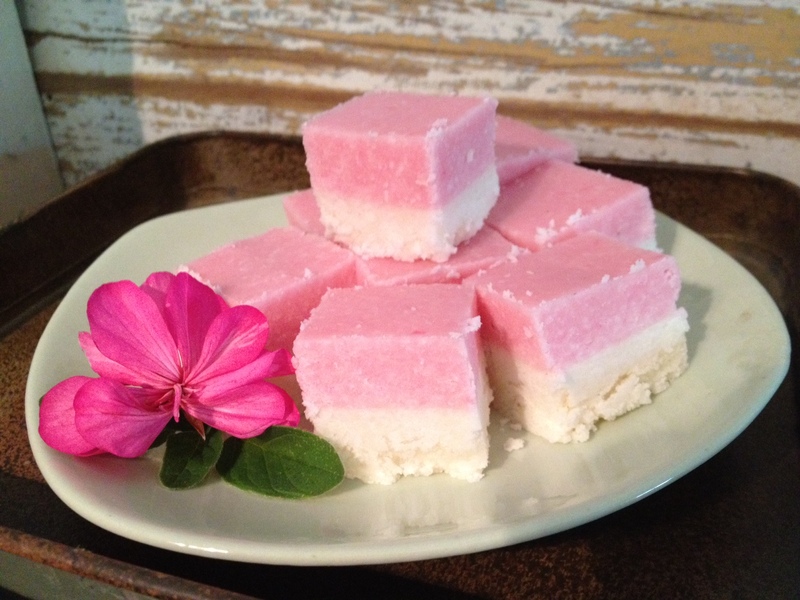 Thank you for sharing your coconut ice recipe, going to try it very soon! Stunning. Have looked for a good recipe for years and have now hit the jackpot. Tx u for giving the recipe. This is the same recipe that my Mum used to make back in the ’60s. And yours looks the exact same in the photos. It’s the egg white that makes the difference I’m sure. She used to make it for fetes and gifts and everyone commented on how good it was. Whenever I bought coconut ice at stalls it was total disappointment as it never tasted creamy smooth like this recipe does. Thanks Nicole for posting. Hello. This sounds cool but my attempts at cooking never come out right. How much beating does the egg white need? Just til it’s slightly frothy? This is the same as my recipe. I add a few drops of coconut essence to the pink as well. Makes lovely xmas gift in a fancy jar. This might be the best cooking blog post intro I have ever read. It’s short and it still brings the bizarre life story, wow!